Funky First Grade Fun: Voila...My New Design! It's my new design that is making my heart flutter today!!! The talented Kassie from Designs by Kassie deserves all the credit. All I really did was choose my favorite colors and send her a million emails. Ha! I loved working with Kassie! She is incredibly talented and patient. I truly appreciate her design expertise. 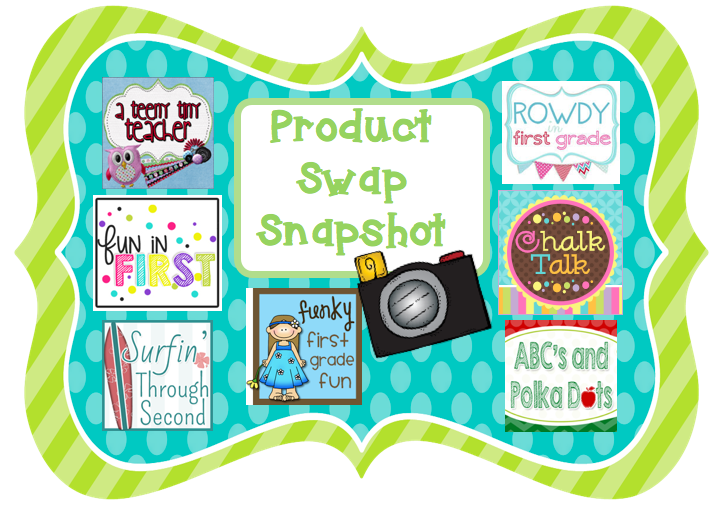 I'll be joining several of my teacher/blogger friends for a Product Swap Snapshot and a giveaway! Please stop back tomorrow for the details! Oh, how I love my new design! Thanks again, Kassie! You are amazing! Kimberly, I love it! It looks great. Been following you for a long time and have been MIA but I always check in. Can't wait to see what you gals have tomorrow. :) Hope you're well. Thank you, Sydney! Hope all is well! I LOVE this new look, Kimberly!! I'll miss your hippie girls a little bit ;), but this color scheme is so calming and you chose some really fun fonts! Super cute! !